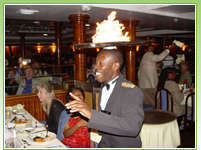 Your fare includes shipboard accommodations, ocean transportation, all meals and entertainment onboard. 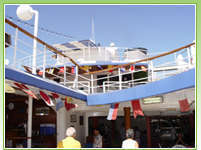 Gratuities, transportation to and from the ship, shore excursions, bar beverages, soft drinks, phone calls, photographs and items of a personal nature that are not specifically stated. A $20 fuel surcharge will be added to your on-board account due to increased costs associated with fuel prices. All U.S. citizens must have valid proof of citizenship - a passport, certified birth certificate or certified naturalization certificate. 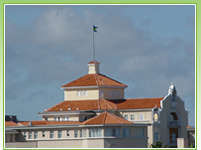 Resident aliens must travel with their "Green Card" Alien registration cards. Guests from other countries should check with their travel agent or appropriate consulate to determine necessary travel documentation. 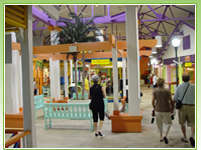 All guests over 16 years must carry a picture ID - state or provincial driver's license with a picture or a government photo ID card. Please note: Passengers arriving at the pier withoug valid documentation will not be allowed to board the vessel and will not be entitled to any refund of fare or compensation. Dress on Regal Bahama Cruise is casual. 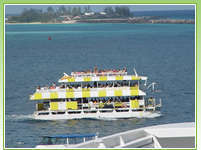 Beachwear and shorts are acceptable for daytime activities on board as well as for shore excursions. Dinner attire is resort casual. We suggest that guests be slightly more formal for the Gala Dinner on the second night. Shorts are not permitted in the dining room at dinner. Regal Bahama Cruise is not responsible for theft or loss, so be sure all baggage and personal belongings are properly insured and labeled with the owner's name, address, and ship's name, cabin number and sailing date. Suitcases should be securely locked. 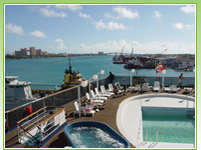 Please personally carry all medications, jewelry, fragile items, valuables and important documents on and off the ship. Any luggage left at the pier will be forwarded at the guest's expense. If you have a specific need or a medical condition that requires special attention, you must advise us when making your reservation and confirm the information to us in writing. Special dietary needs can be accommodated if the passenger makes the request at the time of booking. Passengers requiring a wheelchair onboard must make independent arrangements. Guests may not bring alcohol onboard prior to embarkation and any alcohol found in a guest's possession is subject to confiscation. 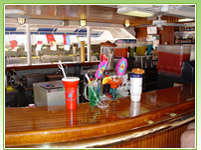 The drinking age on the ship is 21 in US waters and 18 at sea and in Nassau and a valid ID is required. 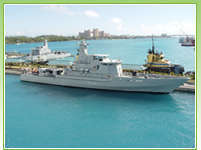 Regal Bahama Cruise has the right to refuse sale and/or service to anyone. 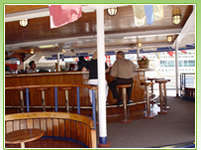 For your convenience, gratuities are charged to your onboard charge card at $19.50 per person. This covers all food and cabin services. 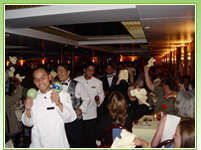 Standard in the cruise industry, on a per-person per-night basis is: Cabin Steward $3.50, Waiter $3.50, Busboy $1.75, and Maitre d' $1.00. Other staff may be tipped as services are rendered. Please note that a 15% service charge will be included on all bar, wine and beauty salon tabs. Secured overnight parking is available at the cruise terminal. The current daily rate is $12 and is subject to change.